There are parts of our house that have been untouched since we moved in. I pity those little corners and rooms...they simply sit with the door closed and the lights off. As the days go by, I'm attempting to utilize every inch of our house, so the "man cave" was the next area on the list. Our bonus room upstairs has pretty much been a holding area for our wedding gifts up until about a week ago. I finally organized and put every little thing in its rightful place, which left a big open, ugly room. This room is still a work in progress, but I figured I could at least update one area of it--the "office" area in the corner. 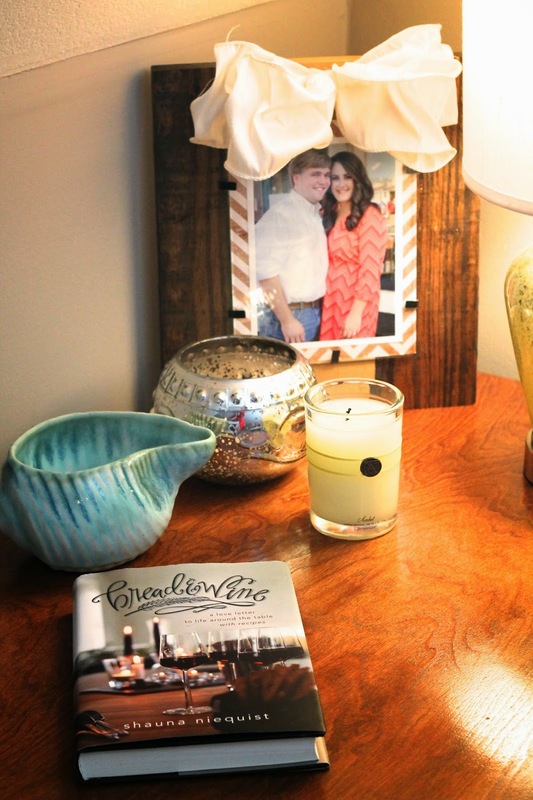 This spot is special to me because my sweet husband made this desk with his own two hands. I love that he loves DIY crafts as much as I do. Every time I sit at the desk, I am thankful for him. Oh, and LOOK! The Goodwill chair makes its debut in the house. Hallelujah! It's nothing special, but it's my little corner of our house where I can sit and write, read my Bible, or just brainstorm. It's quiet and cozy, perfect for stimulating a little creativity. It's a good thing you can't see in the mirror a reflection of the other half of the room...now that's a different story. Another post for another day, my friends. This is adorable Rachel! We have a spare bedroom that is also a storage room/office...I cannot wait to have my own space one day like this! Aw, this is so cute. We are going to get in there and paint Brian's man cave soon, and I hope to get my corner looking better! This space is absolutely adorable! I would never want to leave! We are trying to buy a new house and I am so excited to have a craft room/office that I can decorate!! I'm pretty sure I could definitely be inspired in that nicely decorated corner. Very good job! Happy weekend! I love your space! I'm guilty of never getting around to fully decorating my place and then it comes time to move and I have to start all over again. Maybe one day!? What a cute little area. I can't wait to be able to do stuff like that whenever we get a house. The bow picture frame is just too cute! Beautiful! 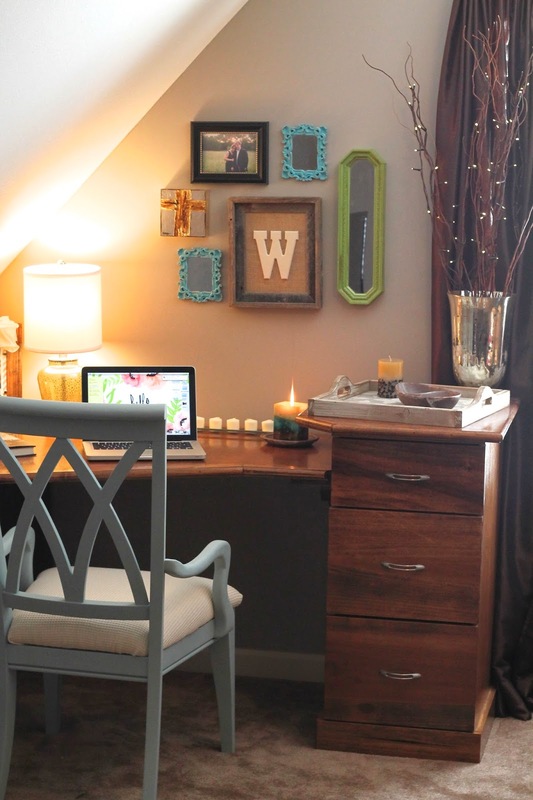 I would LOVE a little office space like this for writing, blogging, bible reading, etc. I may just have to make one! The candles might be my favorite part. They are so relaxing and pretty! Awh I love everything about this! How sweet that he made the desk. My man and I are moving into a new place soon and I can't wait to decorate! I love your blog, by the way. I'm a new follower! Wow!! That is awesome! I wish I could decorate like you :) I need a more creative mind. I absolutely love what you've done with your desk! I love the use of the tray to define the space on top of the drawers. It was just the visual I needed to figure out what was missing on my own tabletops!